We’d love your help. Let us know what’s wrong with this preview of The 5 O'Clock Band by Troy Andrews. To ask other readers questions about The 5 O'Clock Band, please sign up. Another amazing collaboration by Trombone Shorty and Bryan Collier! Having been to New Orleans (where I was lucky enough to meet them both and have them sign this book), I truly felt as if I was transported back while reading this. What a wonderful book about following ones dream and being true to your heritage and yourself. Having been to New Orleans and having loved Trombone Shorty, I enjoyed this book. I did like the first book better though. I think people of New Orleans will appreciate this more than most. Has a good lesson to it. Shorty plays the trombone in the 5 O'Clock Band. They meet everyday after school and homework and parade through the streets of Tremé down to Jackson Square in New Orleans, but today, Shorty was practicing and lost track of time, so the band left without him. "One day I want to be a bandleader, but how can that happen if I can't even get to the show on time?" As Shorty looks for his buddies, he gets advice from the adults in the community, and the reader experiences New Orleans culture. Bryan Collier has brought the city of New Orleans to life again; his rich illustrations along with Andrews inspiring story is a wonderful lesson in honoring commitments, striving to do better, and listening to the grown-ups. This second picture book by Andrews takes the reader on a trip through New Orleans. Shorty and his friends had formed a band. They called themselves the 5 O’Clock Band because that’s when they gathered to play. One day, Shorty got so caught up in his music that he missed the meeting time of the band. He tried to catch up with them, bringing the reader along on his walk past New Orleans landmarks and meeting musicians on the streets. Shorty longs to be a great bandleader and as he looks for his b This second picture book by Andrews takes the reader on a trip through New Orleans. Shorty and his friends had formed a band. They called themselves the 5 O’Clock Band because that’s when they gathered to play. One day, Shorty got so caught up in his music that he missed the meeting time of the band. He tried to catch up with them, bringing the reader along on his walk past New Orleans landmarks and meeting musicians on the streets. Shorty longs to be a great bandleader and as he looks for his band, he learns lessons about being a leader along the way. Filled with a deep love for the city of New Orleans, this picture book continues the story of Trombone Shorty’s childhood. Andrews’ writing is deft and musical, using repetition and rhythm to great effect. The illustrations by master Collier are lush and beautiful. They depict the richness of New Orleans on the page, filled with yellows and greens. Thanks to the Kid Lit Exchange for the review copy. All opinions are my own. 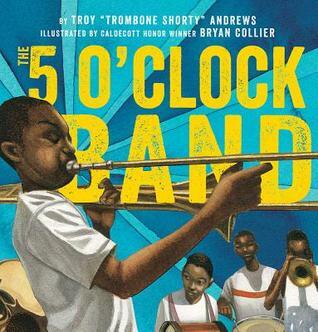 THE 5 O'CLOCK BAND is the second book written by Troy "Trombone Shorty" Andrews with illustrator Bryan Collier. Both are about Trombone Shorty's childhood. Both bring New Orleans culture to life on the page. This one is more episodic—a day in the young life of Trombone Shorty. I liked that as we walked through the day—a day when Trombone Shorty missed his daily show with the 5 O'Clock Band—we learn from neighborhood peop Thanks to the Kid Lit Exchange for the review copy. All opinions are my own. I liked that as we walked through the day—a day when Trombone Shorty missed his daily show with the 5 O'Clock Band—we learn from neighborhood people what makes a good leader. Dedication. Tradition. Love. When you have all three together, you can achieve your goals. The back matter includes an author's note, an illustrator's note, photos, and information about Trombone Shorty's present-day foundation. All is wrapped up so that kids can walk away inspired, informed, and ready to lead. 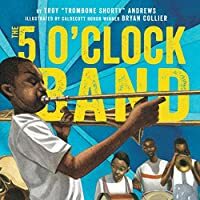 In this sequel to Trombone Shorty, Troy Andrews continues his reminiscences of childhood in New Orleans, and the after-school band he and his friends formed when he was a boy: The 5 O'clock Band. He and co-author Taylor have slightly fictionalized the story to emphasize the values of the Tremé neighborhood: the traditions of music, love, hospitality, and dedication to their art. Collier’s pen and ink, watercolor and collage portray the moral vividly. This wonderful companion to Trombone Shorty takes young readers on a musical tour of New Orleans. The author shares his experience as a young musician who is sad because he's late for his band's daily afternoon music parade around the neighborhood. But helpful friends and neighbors along the way teach him what leadership is all about. This book would be great for budding musicians and also a great way to help develop a growth mindset. This is a great book to follow up last years Monarch book Trombone Shorty. It is about the same topic and time period but has more text and detail. Still had great message of what it takes to be good as something, dedication, tradition and love. The back of the book has more pictures and background information about his life. It is easy to read but older students will find it interesting as well. I loved Trombone Shorty and I love this one even more. Illustrations are magnificent. I love the triptic double page spread of Shorty playing "When the Saints Go Marchin In." Photos and author's and illustrator's notes are just frosting on the cake. Love Brian Collier's dedication - don't miss it! This book is the follow up tale to Trombone Shorty done by the same author and illustrator. For those folks who have spent time in NOLA, this book has a great feel of nostalgia to it. The music, the food, the Mardi Gras Indians, etc... Troy's tale continues to be interesting, uplifting, and encouraging for young people. It's especially a gem for young ones interested in music. Music, music, music. I love music. It should be mandatory. But fun. It's hard to write music into books, but the author and illustrator did this beautifully. The color and vibrancy and the music! The history and heartache... A beautiful story (also about community, commitment, determination) definitely worth reading. The story about a young man who questions his leadership after he fails to meet up with his band to play. This story takes place in New Orleans, and shares some of the history of the music culture that originated out of New Orleans, and the people, who influenced the sound, long before Jazz had a name. Very cool book with vibrant illustrations - what does it take to be the best bandleader? What does it take to do anything well, really? Love, Tradition, and Dedication. Excellent qualities for anybody to aspire to have. Yeah, it's a children's picture book, but it reminds me of watching the HBO series "Treme". Shout out to Peggy Michelin who put a hold on it for me at the library, EVEN THOUGH she didn't watch TREME (too much music?!? WHAT?? ), she did take a pic of the Treme street sign. "We have dedication. We honor tradition. And, most of all, we play with love. Now I know what it takes to lead." Another joyful celebration of Trombone Shorty and his city of Treme see through the musician's eye. A bit more text heavy compared to its companion book (which I highly recommend). Trombone Shorty shares about his first band with his friends. He learns about being a band leader from the adults in his life. Vividly colored illustrations help bring this book to life. Info text at the end. So lovely, the rich illustrations are amazing and bring the story to life. Entertaining read. Worthy follow up. The illustrations and story combine together to make the reader feel as if they are in New Orleans. This is one of my new favorite books! This book takes readers on a tour of New Orleans during Mardi Gras. Don't miss the end pages where you can learn about the read 5 o'clock band. Colorful illustrations and an entertaining tale about the City of New Orleans, its music, and its people. A smidge heavy-handed, but fun peek into a boy’s life in NOLA. This book is a study in New Orleans culture with a lesson on personal growth woven into it. It's going to make an excellent mentor text! An excellent book about music and character. I would recommend this to children interested in music, New Orleans, and personal goals. Love Trombone Shorty's message in this book about leadership. Beautiful illustrations and enjoyed the notes at the end. A fun discussion of what qualities lead to success.... no, seriously, it's fun! Partly because the pictures have so much energy.